The typical brain activity patterns associated with major depression are unbalanced frontal lobes where the left hemisphere will present excess alpha (slow) brainwaves compared to the right hemisphere. To explain the phenomenon in a very simplified way, let us keep in mind that, in general, the right brain frontal lobe is primarily involved in negative emotions, while the left frontal lobe is primarily responsible for positive emotions. In the case of major depression, we generally notice an unbalance between the frontal lobes in which the left hemisphere (involved in positive emotions) shows slower activity. 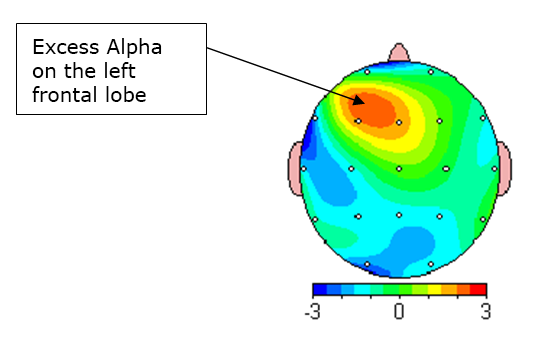 On the electroencephalogram, this will translate into greater alpha slow wave frequencies on the left frontal lobe, as shown on the attached illustration. With neurofeedback, we will then use a training protocol that will rebalance the activity of the frontal lobes. These protocols have been proven to have an efficiency level of 4/5 according to “Evidence-based Practice in Biofeedback and Neurofeedback”, a reference guide on the effectiveness of the approach. In fact, these expressions reflect quite well what is happening with the person’s brain activity. Indeed an anxious person is going to have an excess of very fast brainwaves called high-beta. The neurofeedback training will therefore be used to reduce the high-beta brainwaves. In doing so, the person will feel calmer and the anxiety level will decrease. It is often observed that the sleep quality is greatly improved by this type of training.